And day 5 of the wish list. The Durtbagz mission is to have people point and laugh at you. Seriously. And you want them to laugh at you, or you wouldn’t be wearing Durtbagz gear: bagz and shirtz featuring the dangerous throes of satire illustrated a la yellow and black road signs. Erin Atherton’s gear is classic and brilliantly uncouth. I’ve been in love with Not Wet When Dry since day one. Everyone else seems to love A Priest, A Rabbi, and A Horse, which is a best seller. THIS HOLIDAY SEASON, I THOUGHT I’D MAKE SHOPPING FOR ME A LITTLE EASIER ON YOU. NO, I’M NOT LETTING YOU OFF THE HOOK BY TELLING YOU THAT THE HOLIDAYS ARE FOR SPENDING TIME TOGETHER, AND I DON’T NEED ANYTHING MORE THAN THAT. PEOPLE WHO SAY THAT ARE LIARS. I KNOW I’M A BIT DIFFICULT TO SHOP FOR, SO HERE IS EXACTLY WHAT I’D LIKE THIS YEAR. I WANT TO BE A DURTBAG. I COULD REALLY USE A NEW (circle appropriate one) DURTBAG/DURTBAG SHIRT FROM DURTBAGZ.COM. SPECIFICALLY, I’D LOVE THE (fill in with bag/shirt title/size here). TO HELP YOU OUT EVEN MORE, USE THE CODE “IAMDURTBAGZ” FOR A 10% DISCOUNT ON WHATEVER DURTBAGZ GEAR YOU GET FOR ME. THANKS IN ADVANCE. I CAN’T WAIT TO SPORT MY DURTBAGZ NEW GEAR! Or geek spring break as it’s sometimes called. And day 4 of the wish list. In other words, it’s the place to be. So if you know and love a geek whose not yet registered, sign them up! Last year I missed it. In truth, I had never even heard of SXSW until sometime in late January. I was still a n00b to the local geek scene. I didn’t really understand what SXSW was, nor was either myself or my company in a position to foot the registration fee. So I sat home. But oh how I wanted to go! To absorb the culture and knowledge surrounding current developments interactive and social media. And to hang out with all the #phx geeks I’d recently me and knew would be there. And day 3 of the wish list. I first learned about Reactee over a year ago from Springwise, a cool trend observation site. Since then, I’ve met @soul4real who tweeted about wanting a Reactee, and Byron, who owns and wears one. Do you sense a little “but I knew about them first” here? I do. 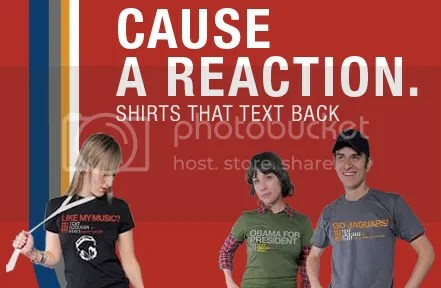 Back to the point, Reactee lets you create a tee shirt to pimp pretty much any subject you want, from your favorite cause to your self. The shirt design is simple with a few customizable components. You pick your own headline and text keyword. You can also add a graphic by selecting one of the default options or uploading your own. Wear your tee out and about, and curious passersby who text your keyword to 41411 will receive a reply message from you. At $20-25 (plus shipping) for a Reactee, it’s a really cool, and inexpensive, means of marketing. Design a tee for yourself or get a gift certificate for someone else. I haven’t bought one for myself yet, primarily because I haven’t figure out what I want my headline to be. Although now that I’ve started merciless flirt, I may just use Reactee to pimp that. And day 2 of the wish list. A couple of years ago, Experience Studio (my former company) was moving into a new office space and searching for really cool office stuff. One place we looked was Artafax at Kierland Commons in Scottsdale. 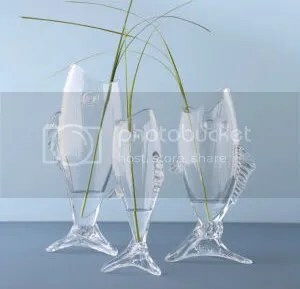 I spotted a trio of fish-shaped vases filled with various flora and fauna. Yes, I said fauna. One of the vases was being used as a fish bowl with a real live fish chillin’ in his own likeness. Very cool. While Artafax repurposed their fish-shaped vase as a fish bowl, SkyMall has an actual fish-shaped fish bowl. Also very cool. If you do a little research on the care of fish and fish bowls, you’ll quickly learn that fish bowls don’t provide an ideal environment for pet fish. The two biggest issues are that most fish bowls are 1) too small for adult fish, and 2) too small for filtration systems. 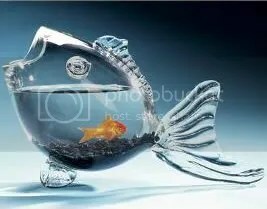 If there are any good fish bowl fish, they might be betta fish and paradise fish, both of which have the ability to breath oxygen from the water surface. Whether you want (or want to give) a fish or a decent reason to have a really cool fish bowl, it might not be a bad idea to ask a pro at a local pet care store before you buy anything. And day 1 of the wish list. If you’re an architecture, art, and sustainability enthusiast in Arizona, you’re probably familiar with Paolo Soleri, an Italian-American architect well known for his thoughts on sustainable urban growth. Deemed arcology (architecture + ecology), the goal is a hyperdense city that facilitates human interaction, optimizes access to shared infrastructure, minimizes use of valuable resources, reduces waste and pollution, and encourages interaction with the natural environment. Arcosanti, located 70 miles north of Phoenix, is the living labortory for Soleri’s explorations of an arcology for the high desert. 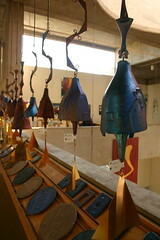 Perhaps lesser well known are Soleri’s ceramic and bronze windbells. I’m partial to the bronze windbells. They are moldcast, but each is truly unique in their burnishes and patinas. The smaller, simpler bells are priced as low as the mid $20s, and there are quite a few bells under $100. 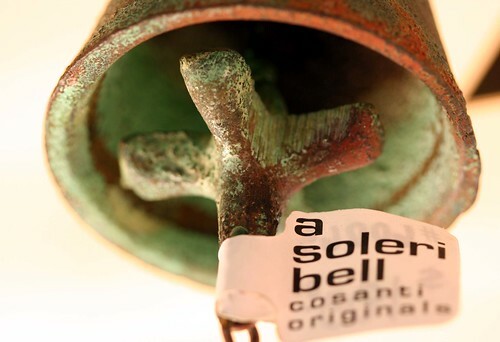 There are also cause bells whose designs reflect any one of a number of local or global concerns, including wildlife preservation, hunger, and literacy. Proceeds from all bells support the continued construction and programming at Arcosanti. 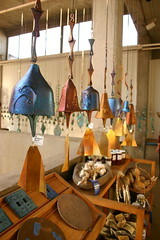 You can buy the windbells at Arcosanti and Cosanti (6433 E Doubletree Ranch Rd in Paradise Valley), as well as local shops and retailers. Last year at this time, I purchased one a patina bronze bell for my parents at the Phoenix Art Museum store. Which means Christmas is just around the corner. I love the holiday season. The parties, the traveling, the hot spiced wine (a family tradition), the rum balls. And the giving. Oh, the giving. Every year, with Budget in mind, I compile a list of who I’m shopping for, what I think they’d like, and cap on what I want to spend. With out fail, I not only exceed Budget, but wring its neck and bury it six feet underground. Some might call it manslaughter, but I call it justifiable homicide. After all, it’s about the high of being able to give cool stuff to my peeps. Budget gets a stay of execution this year as financial limitations equal giving limitations. But that doesn’t mean that I can’t do my part to help stimulate the economy. Other people will be shopping for gifts (including my parents who buy me stuff even if I tell them not to). So starting on Black Friday, I’m going to [try to] write about one thing each day that I think would make a cool gift. I’ll [try to] keep it unique and interesting. It’ll all be stuff I like, but I’ve heard that if you really like something, then chances are someone you know will really like it too. My hope is that you’ll discover something that’ll be loved by a sibling, friend, parent, spouce, or yourself. And when you do, buy it, wrap it, & put it under the tree.